Surviving a serious traffic accident as a teen, Kahlo suffered health problems throughout her short life, which resulted in somewhat of an isolated life, one reason she did so many self-portraits – 55, to be exact. 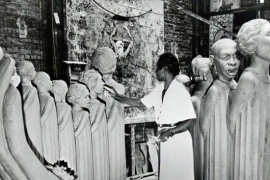 Married to Diego Rivera, another famous Mexican artist, the relationship was often described as volatile and passionate. While the marriage was considered a stormy, rocky relationship, it survived not only Kahlo’s poor health, but infidelities, an inability to have children, even her bi-sexual affairs and the pressures of a career only passionate artists can truly understand. Frida’s art often spoke volumes of the pain and tragedy she suffered throughout her life, first after being struck by a bus at the age of 18 that left her body in shambles and caused her to endure more than 30 surgeries, and having survived polio. Frida’s talent was creating exquisite Mexican folk art, a passion that helped her express her experiences in life. 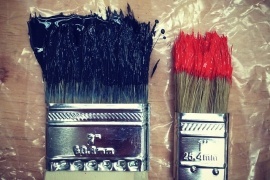 In fact, it was said by one critic that Frida’s paintings were essentially her biography. Frida was 22 years old when she married 42-year-old Diego Rivera, and although their turbulent, passionate marriage endured nearly every heartache imaginable, the two divorced and remarried at one point. Perhaps something she once said summed up her deepest feelings: “I suffered two grave accidents in my life . 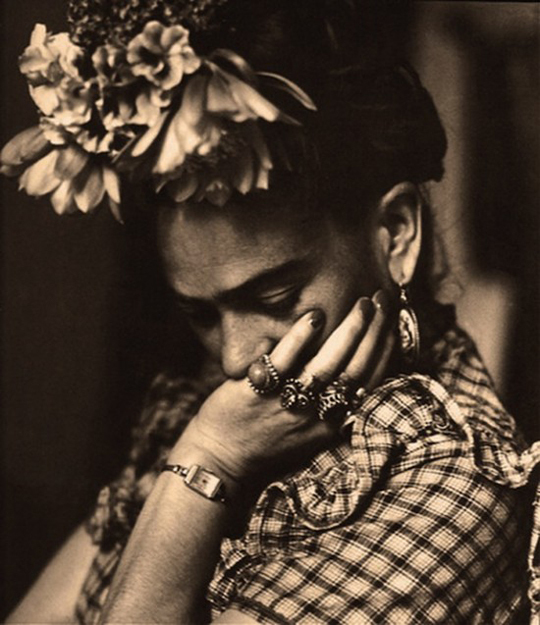 . . One in which a streetcar knocked me down and the other was Diego.” Sadly, Frida was crippled both physically and emotionally, although perhaps the tragedy in her life is what made her one of the greatest and most expressive artists of all time. 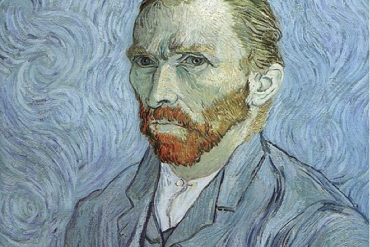 It seems that many truly inspiring artists have led lives that were fraught with pain, emotional trauma, and other experiences many of us never endure. 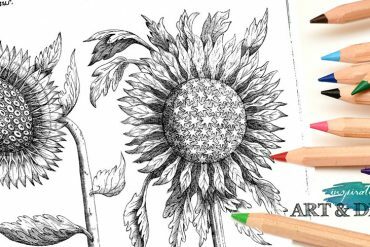 Perhaps this is what makes the creative works of these artists so inspiring, unusual, expressive, loved by people all over the world? While Frida’s life was brief and what could only be described as tragic, her legacy lives on today. The paintings below are a few of our favorite and expressive Frida portraits that capture the essence of her life experiences. 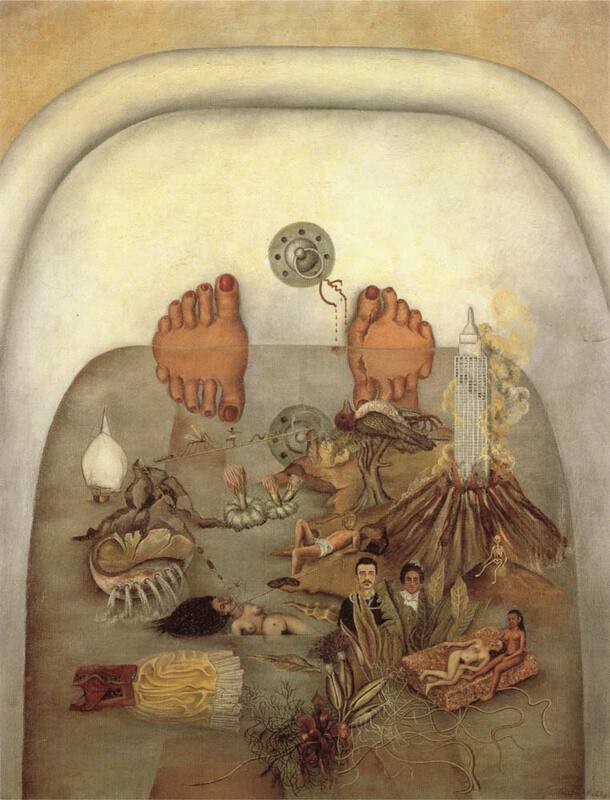 What the Water Gave Me was Frida’s memoir of her life, depicting life and death and comfort and loss. In the midst of her vision lies the way in which Frida found herself submerged by her life. Roots is said to be an expression of Frida’s inability to have children. 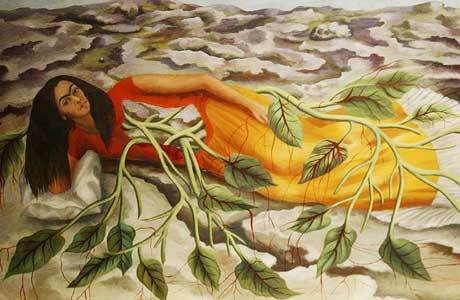 Giving birth to a vine, this self-portrait of Frida shows a vine flowing from her heart and away from her body rooting towards the ground. As you look closely you will see the parched earth cracking and the feeling that she is close to being swallowed up by the earth. 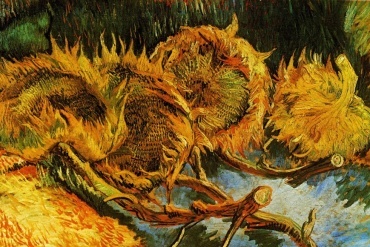 The painting has a delicate balance between hopeful life and desperation. The Broken Column is one of Frida’s most tormented self-portraits. 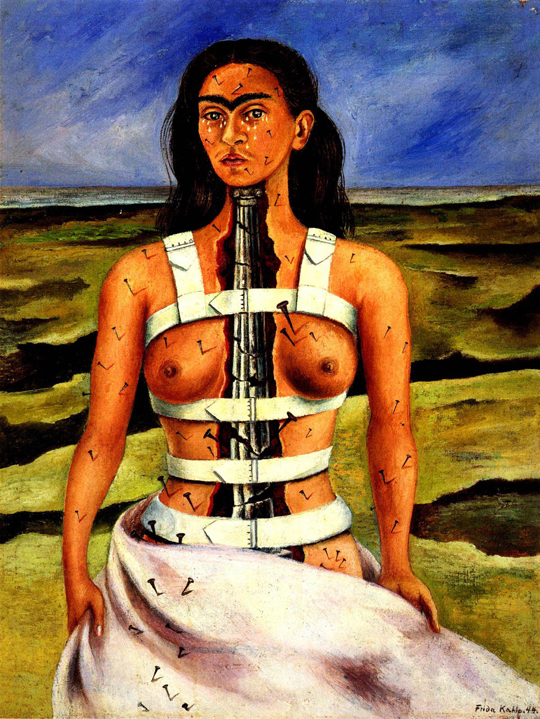 During 1946–1950 Frida Kahlo underwent 8 operations to her spine. This painting is an expression of the operations and her pain. 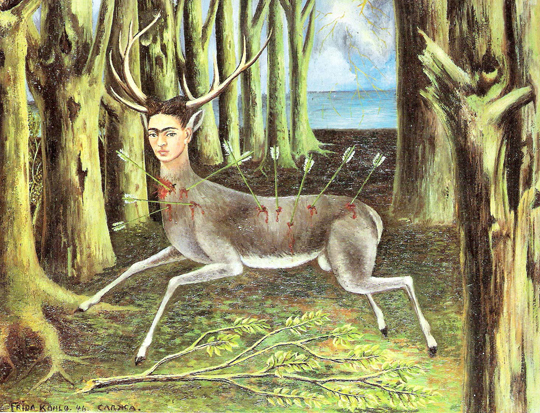 In The Wounded Deer, Frida Kahlo paints herself as an animal and human hybrid. 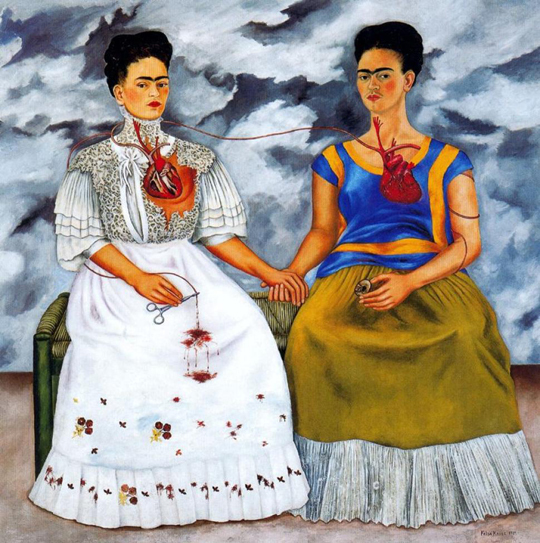 Kahlo is representing herself as part male and part female, as well as elements of human and animal features. Around the time she created The Wounded Deer, Frida Kahlo made a drawing of a young deer in her diary, which is thought to be inspired by her pet deer, Granizo. Frida Kahlo. The Two Fridas, 1939. Oil on canvas, 5’9″ x 5’9″. Museum of Modern Art, Mexico City. See more of Frida – three of her most compelling paintings – click/tap here. 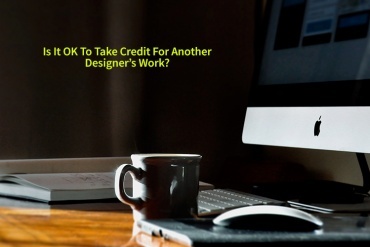 When Is It OK To Take Credit for Another Designer’s Work?